Kansas City Chiefs outside linebacker Dee Ford has been placed on injured reserve with a back injury, according to Terez Paylor of the Kansas City Star. The 2014 first-round pick out of Alabama has not played (and the Chiefs have not won) since Week 8. He finishes the season with just 316 snaps, two sacks, five quarterback hits, eight quarterback hurries and eight stops. 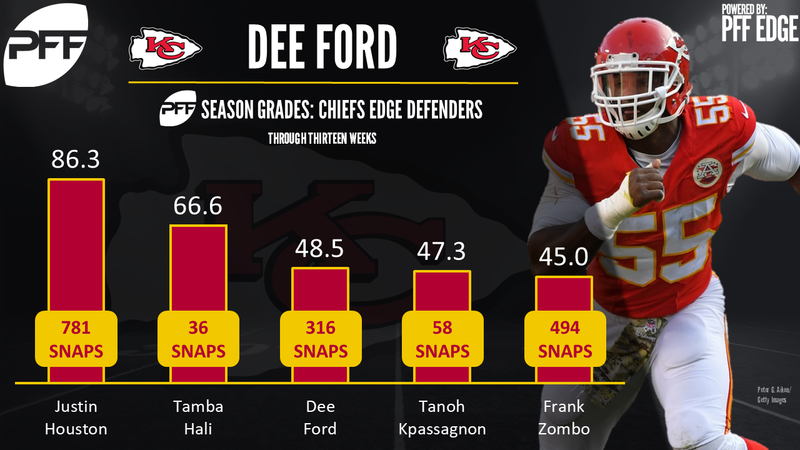 Without Ford the Chiefs have really struggled to generate a pass-rush, generating only the 29th-best grade in that department through the season’s first 13 weeks.